Over the course of the past year we have been blogging pretty steadily. Our blog Redesigning Mental Illness is our shot at social innovation. What can change the experience of mental illness in America? We think ordinary people can rediscover their capacity to support mental and emotional health. We've also been writing about the connection between gun violence and mental health. 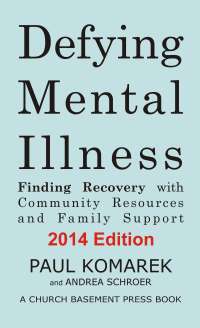 Some of this writing has found its way into the 2013 edition of Defying Mental Illness. Recently we've launched a new blog called Grassroots Educator. Here we focus on the educators in American society who never send out report cards. Think about child care workers, afterschool program workers, mentors, adult education workers, workforce development program instructors. What can we do to help kids and adults achieve success in life? Our first posts focused on justice systems in schools. We think the answer to bullying is not a set of rules or an assembly program -- it's a commitment to justice within schools and communities. And then there is the so-called microblogging -- for updates on mental health, education and social justice issues follow @pkomarek on Twitter.